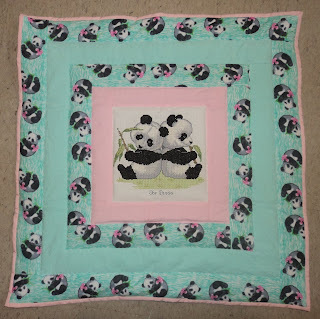 I've been doing a lot of quilts and have gotten more into patchwork quilting then I ever thought I would! 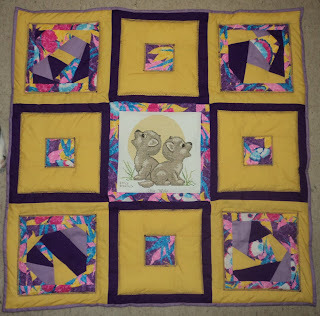 I shall endeavour to post pics of some of these quilts along the way, but my most recent completed UFO is my sewing machine cover and instead of the planned over the arm pockets I made a pad with pockets for in front of the sewing machine to keep things within reach. 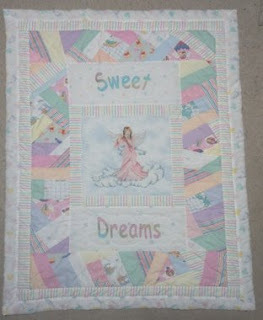 Here are three more completed premiee quilts for the Angel Quilt Project. 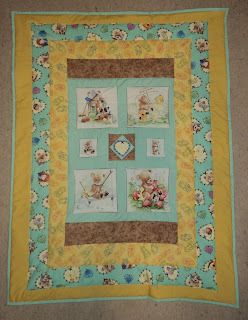 The fabrics in this quilt are scraps used up from other projects including from the next quilt picture shown. These fabrics were purchased special for a premiee quilt as they were so cute. Was able to use leftovers in a second quilt. 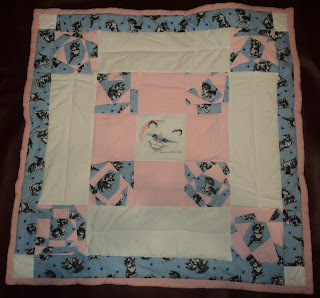 The pink in this quilt was a last piece of scrap fabric but the rest was purchase special for this panel. 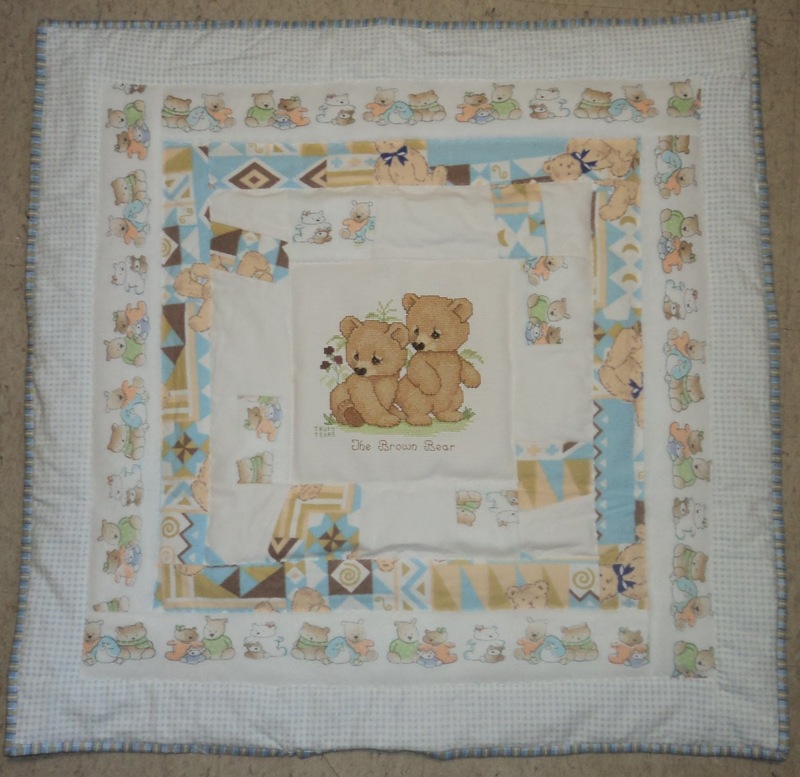 This crib quilt was made for a young couple in my church branch ho just has their second child. 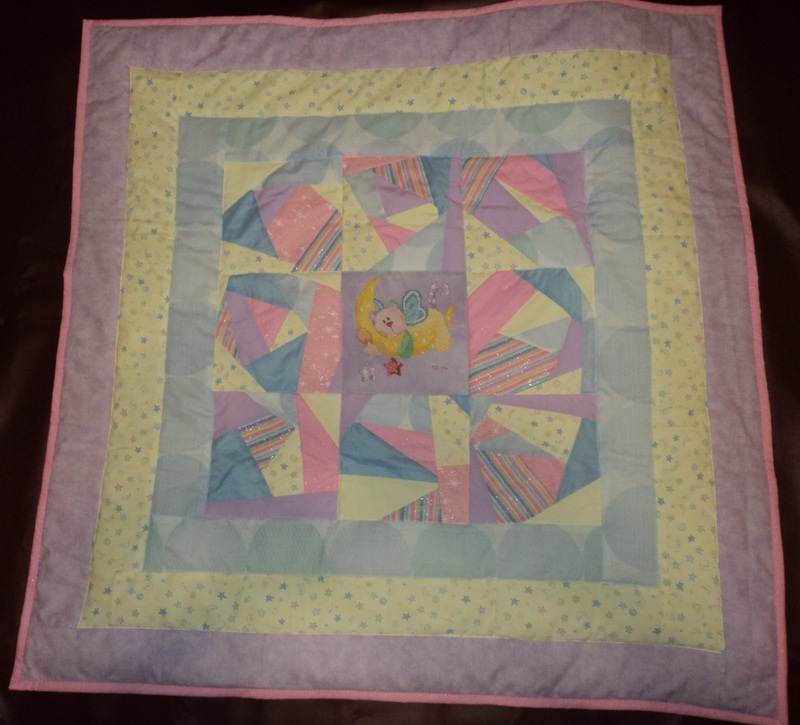 Three more quilts completed for Angel Quilt Project. The first border is crazy patched with scraps of all the other borders. These fabrics are fleece and flannel. 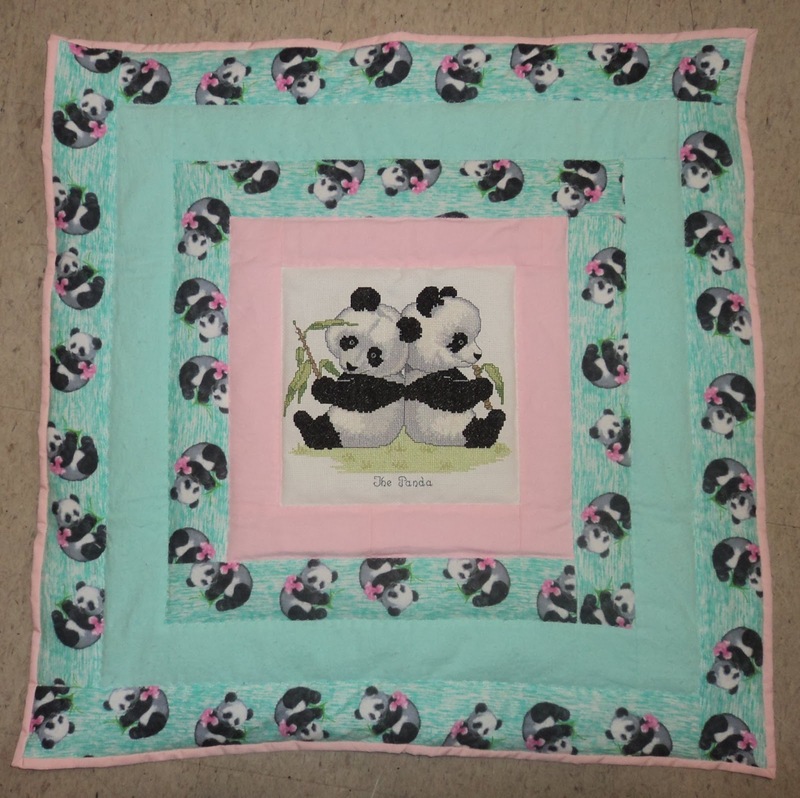 The binding and backing are cotton. 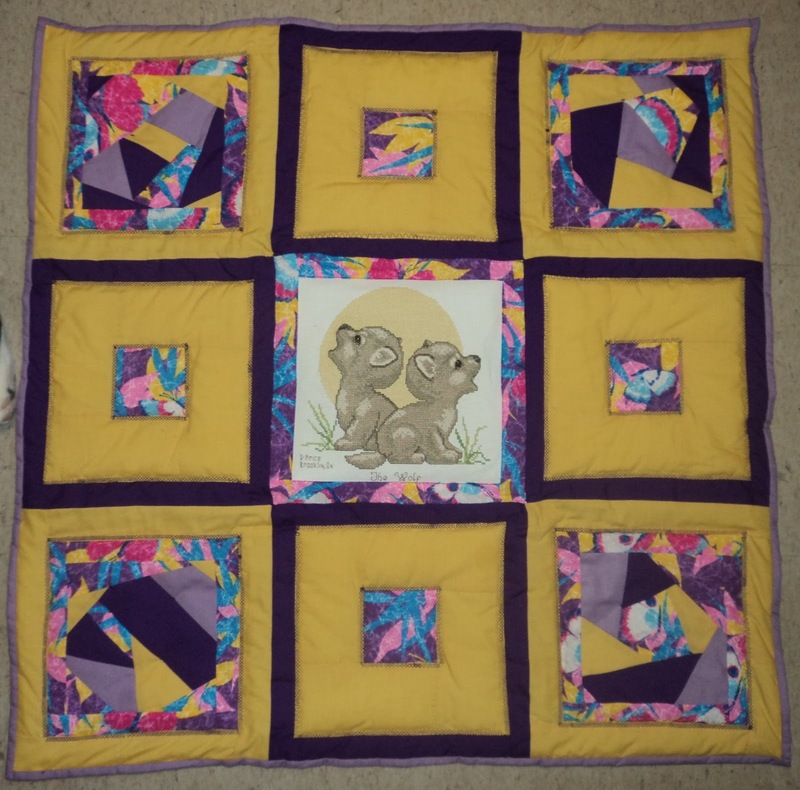 The fabric in this quilt are all flannel except the binding and backing. 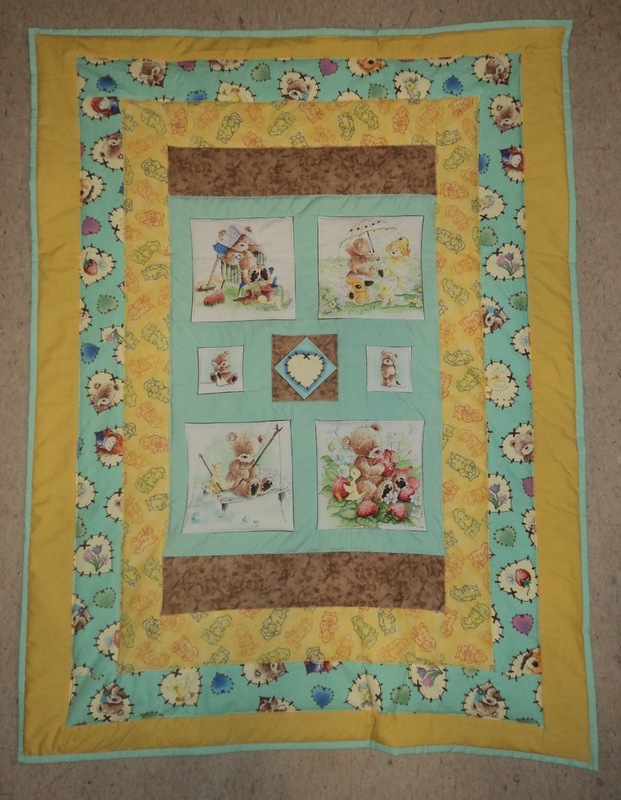 This quilt uses 4 crazy patch blocks and then bordered with some of the fabrics. 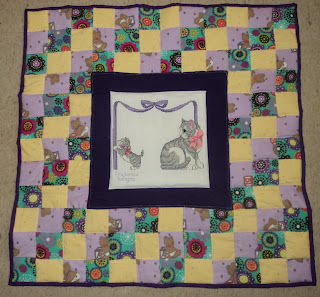 4 blocks where then made using those same fabrics. All of these fabrics were pieces left from other projects. 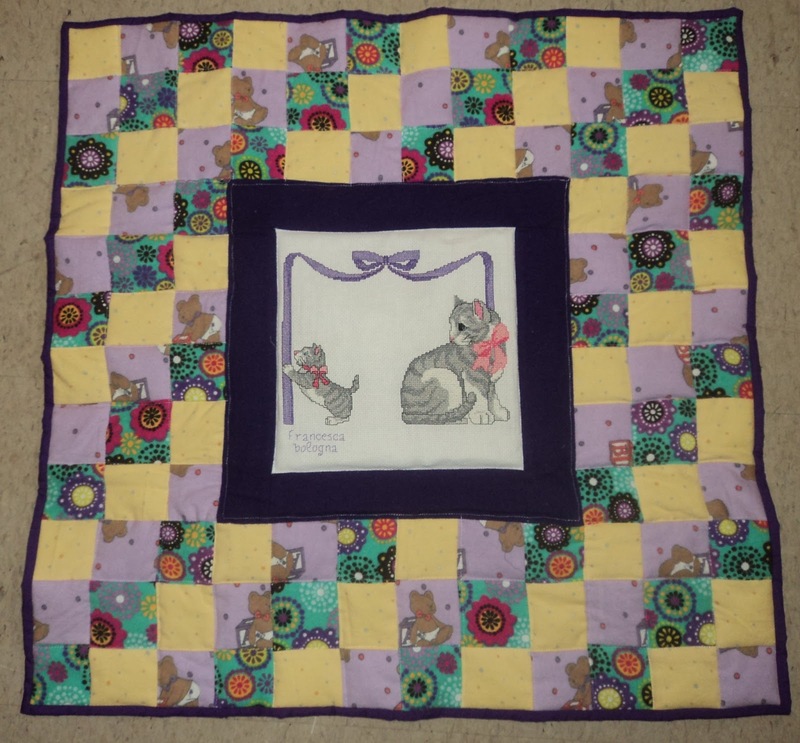 These quilts were all completed in the Summer of 2012 but I never got around to posting about them. 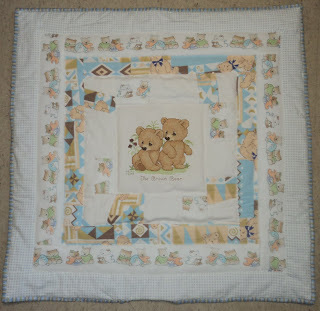 Today I was looking at a blog post about scrap quilts and to comment if we'd made any. Well these were all made from scraps (other then the background of course. 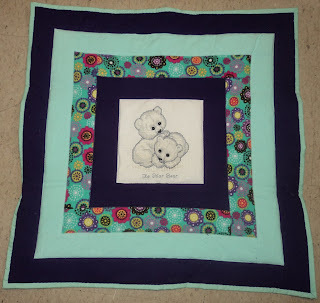 Even the border of the blue one is done with scraps :)! This Teen Crazy Quilt was donated to the Listuguj Pow Wow committee to raise funds for their fabulous Pow Wow that we enjoy each year. 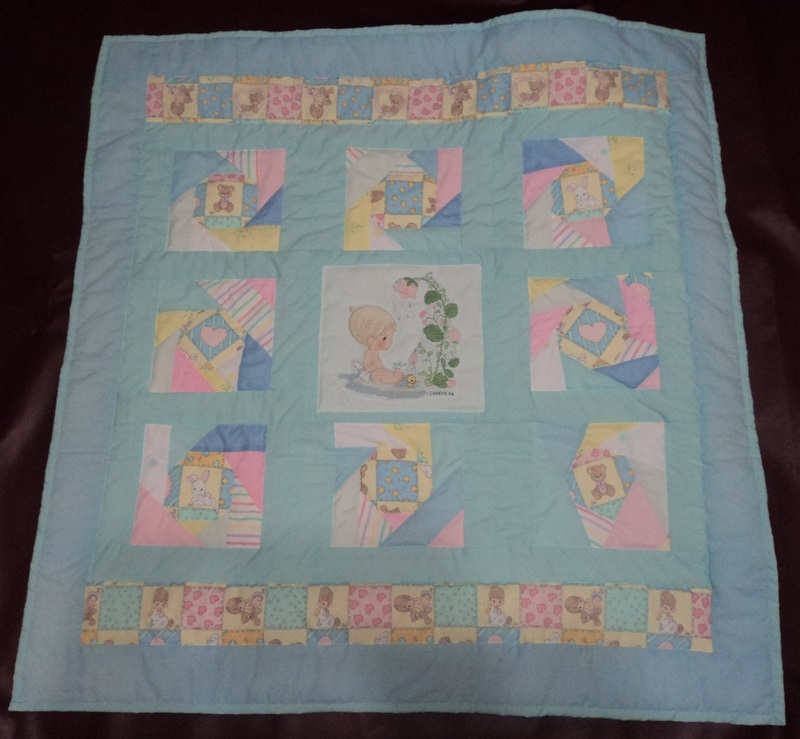 I have finally completed this crib size quilt. 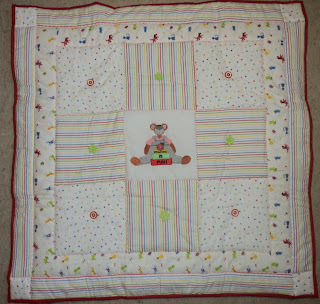 I had my mother layer the batting, top and backing and machine quilt most of it and then add the binding. 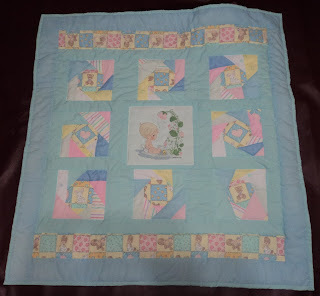 That was before I came across a tutorial that made me realize I could do small quilts on my own kitchen table using painter's tape. Once mom was done she returned the quilt for me to do the hand quilting around the angel and the words which are quilts with a cloud shape around them. 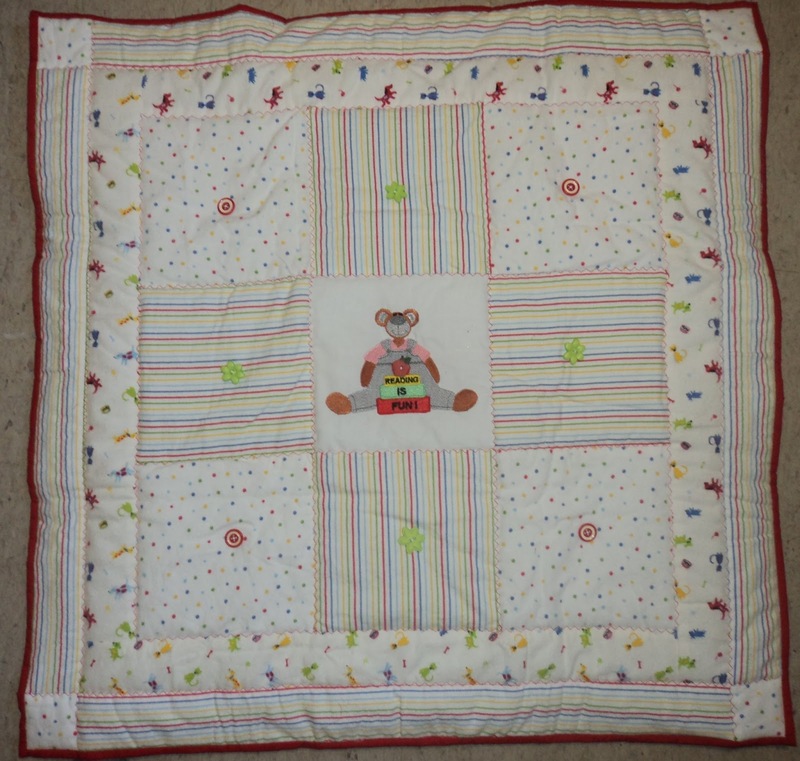 This quilt will be travelling to my new Great Grand Nephew come Friday when I can make it to the PO. I should have posted the pics of my Christmas Crackers ages ago but have been keeping myself busy enjoying finally getting back to my sewing machine. 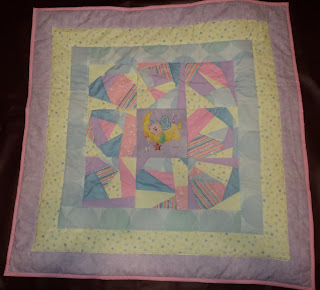 Here's what I've been up to... 3 little quilts for premiees for the Angel Quilt Project.